I know what you are thinking. I am a blog-post repeater. I could tell you that the rotting bananas were causing such a scene that People Asia was knocking down my door demanding to know what the smell was. I could tell you that oh no, I haven’t posted about banana bead before, nor banana muffins, oh no not me. I could tell you that this isn’t banana bread at all…but that would be a lie. And a shame too because then I wouldn’t get to tell you about the streusel. Yes! That burnished blanket of crumble and nuts that is valiantly trying to disguise my blog-post-repeater-ness. It’s a wonder what the right accessories can do! I love the humble banana bread, and in all likelihood this isn’t going to be the last time you see it on this blog is one form or another (eep!). I can’t help it! And I can’t say that I feel totally to blame for it either. I mean, I’ve already got one go-to recipe that has served me well, but food bloggers everywhere just keep coming up with more and more convincing classics and enticing variations! How can I resist? Anyway, enough chatter and on to the streusel! I had bookmarked the recipe way back when from my good friend Christine’s blog, Ramblings From a Gypsy Soul. I had been meaning to try her definitive banana bread recipe, but when my bananas were on the brink and ready for cake there were only 3 left. I used this recipe from Elise of Simply Recipes that I have used before. It uses 3-4 bananas and makes one loaf so it was perfect. Because I was making only one loaf I halved Christine’s streusel recipe. This mixture of flour, sugar, butter, and walnuts is deceptively simple but high on deliciousness. 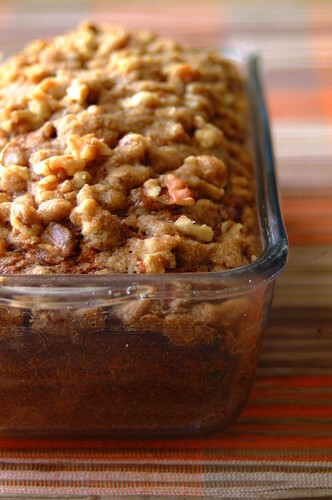 It adds a sweet crunch and moist chew that is ideal…especially as I am a firm believer in walnuts in banana bread, even if making this for my brother always involved forgoing the nuts. Plus, it makes your banana bread look gorgeous! It came out of the oven looking transformed by its high golden crown of goodness. You know what I’m talking about…this is the same glow you get toting that fabulous bag on your elbow, or feeling the swish on those new drop earrings on your shoulders…the right accessories can do that.